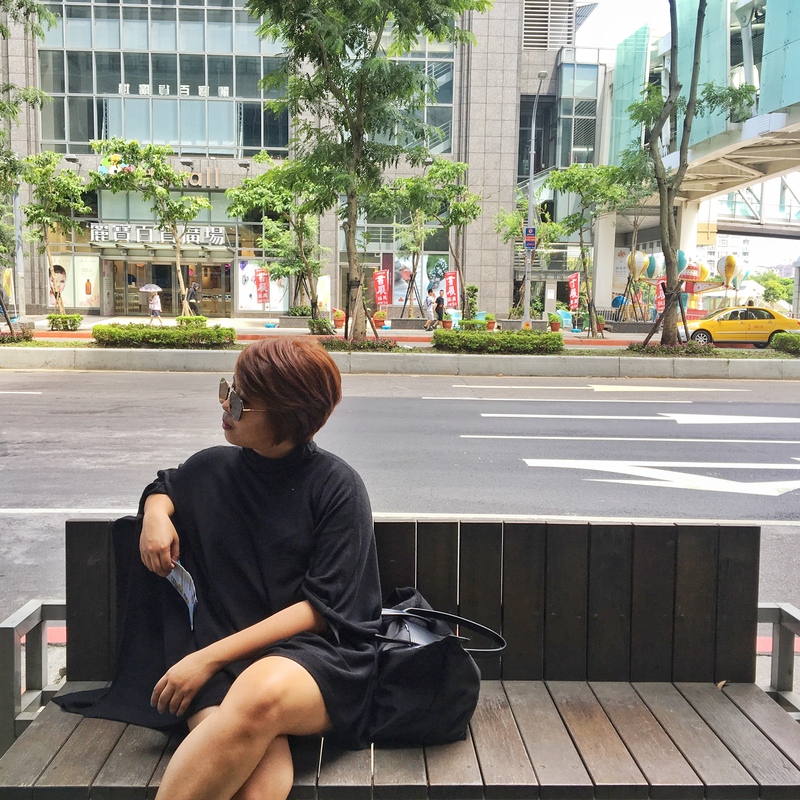 VietCam 2015: Itinerary and Expenses – Dreia-lity bites. I just came back from a weeklong trip to Vietnam and Cambodia and I am very eager to blog about our trip due to a lot of messages I received asking our itinerary and expenses on this trip. People often has a misconception that travelling is expensive. I thought so too. But after travelling for quite sometime, both local and international, researching and making itineraries, I learned how you can save and still make the most out of your trip. With that, let me share how we came up with a trip that cost us 20,000 – 25,000 PHP to 2 Asian cities in 6 days. 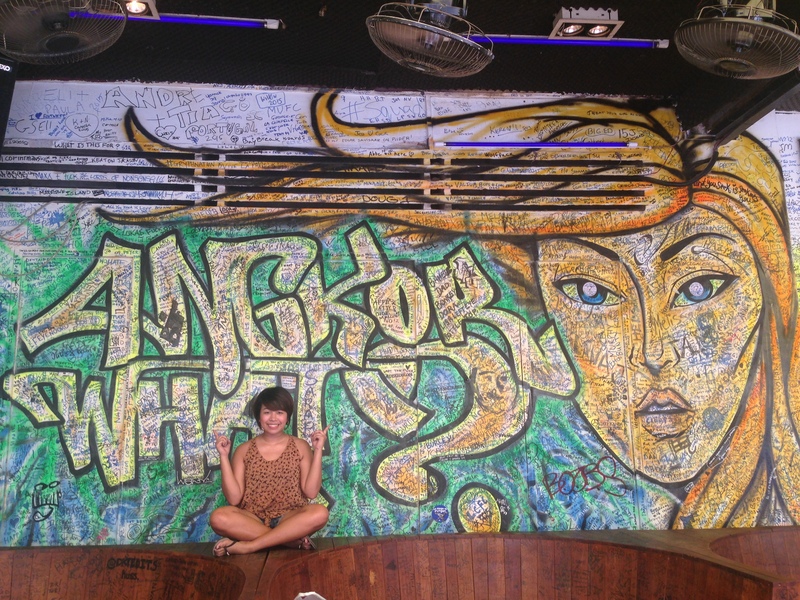 On this post, I will give you an overview of our expenses and activities in Ho Chi Minh and Siem Reap. And some tips on how you can save on your trip. Our airport transfer to our hotel was 17USD (per group) in total. Tuktuk ride for Angkor Wat tour was 15USD (per group). So this will still change depending on how big your group is. I strictly followed my intended budget for this trip. My pocket money was 20,000 PHP. 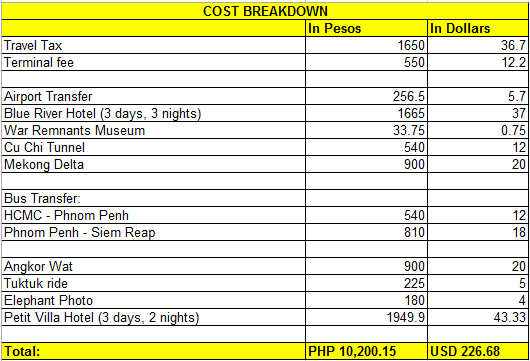 Adding the airfare, this trip cost me roughly around 25,000 PHP. In Vietnam, one meal ranges from 60,000 – 100,000 VND. One plate of spring rolls costs 60,000 VND, Pho costs 60,000 VND, Banh Mi in the streets costs 15,000 VND, coffee is around 20,000 VND (cheaper in the streets). Luckily, our hotel offered free breakfast, so we only have to worry about lunch and dinner. 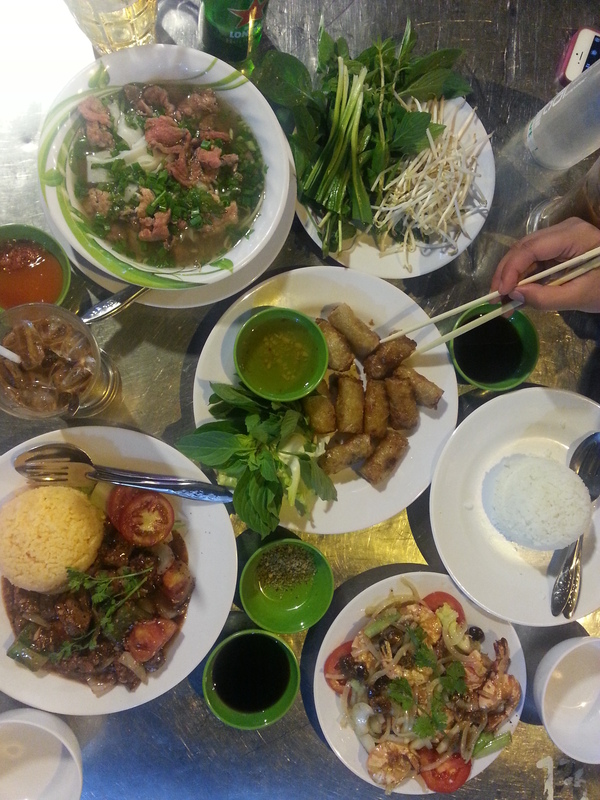 During our Mekong Delta tour, lunch was included also. I would say, I spent 25 – 35 USD for food and drinks (beer and water). So, that is 1000 – 1600.00 PHP max. In Cambodia, one meal ranges from 3USD – 5 USD. Our hotel also offered free breakfast, so we only have to worry about lunch and dinner. I would say, I spent around 20 – 25 USD for meals in Cambodia. So that is around 1200PHP max. 1. It is a good practice to buy big bottled water (1 or 1.5L) which only costs 8,000VND in the convenience store. Then have a small bottle that you will refill every time you go out. This will keep you from buying water or juice when you dine out (which costs more). Probably, during the entire trip I bought 5L of water, 1 beer, 1 cocktail, 1 fruit shake, 3 coffee only. 2. I also brought snacks and instant food on our vacation. I bought some chips, cookies, cup noodles and canned goods because I know Vietnam food includes A LOT of veggies. And I don’t really like veggies. If you’re like me, who is picky with food, make sure you bring along some food that you like. 3. Try street food! Vietnam is known for their sidewalk stalls. Bahn Mi costs 15,000 VND only, we had grilled porkchop with rice, and it only costs 40,000 VND. While eating at a restaurant is pleasant, I would also suggest, try eating like a local. Maybe have Bahn Mi for breakfast or eat at Ben Tanh’s Night Market, you’ll find cheaper food there. There are more motorcycles in the city than cars! Our hotel in Vietnam was located in the backpacker’s area. We can walk to the market if we want to, but we opted to ride cabs instead. It saved us a lot of time. Taxis in Vietnam are all metered. Their flag down rate for small cars is 11,000VND and for big cars is 12,000VND. Our cab ride ranges from 15,000 – 45,000 VND. So per person, we usually pay 5, 000 – 15,000 per ride. It depends on how often you will take the cab, but it is safe to allot 100,000VND or 225PHP. Meanwhile, in Cambodia, I have noticed that there are no taxis around. Your main transportation is a tuktuk. We were always charged 1USD per person, but later on we haggled for 2USD (for the 3 of us). That is with the exception to the Angkor Wat tour. Tuktuk for sunrise viewing of Angkor Wat (4:30AM) is 20 USD, if it’s not sunrise viewing, it is 15USD. Also, we were offered a Floating Market and Angkor Museum tour, tuktuk price was 5USD each. We declined the tour, but we asked to be toured in the city instead. We went to the market, pub street, souvenir shops, with the same tuktuk price 5USD. So, it depends on what’s going to be your activity, but I think it is safe to allot: 25USD or 1125PHP. You could rent a motorcycle in Vietnam and bike in Cambodia if you want to go around for a day. That would save you from riding cabs and tuktuk every time you go out. You can inquire in your hotel if they have motorcycle or bike for rent. 2. If you decided to take the cab, follow the meter. We’ve encountered a taxi driver who was asking us for 50,000 VND for a 17,000 VND meter. We just gave him the exact amount and left. Souvenir stores inside the post office. I would say the biggest portion of my pocket money (aside from the basic expenses) went to souvenirs. I did not take note how much exactly I spent for souvenirs, but basing on what I spent for basic expenses, food and transportation, I think I am left with roughly around 6000PHP to spare. I’m not sure if that amount for you is big or small, but with that amount I was able to buy: 2 original North Face backpack, Class A Giorgio Armani satchel bag, Class A Cath Kidston shoulder bag, an elephant designed body bag, 4 Tshirts, 5 sando tops, 1 Alibaba pants, 1 painting of the Angkor Wat, 8 small boxes of Vietnam Coffee, 1 pack of chocolate, 1 pack of dried fruits, 1 chili powder, 20 ref magnets, 2 Pashmina scarves, 8 small and medium pouches, 1 Vietnam farmer hat. 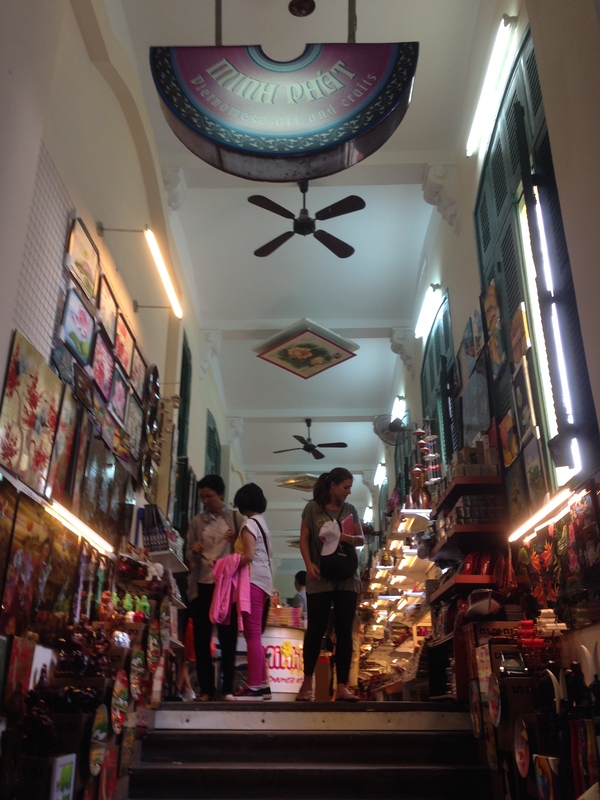 For souvenirs, I strongly suggest for you to buy in Saigon Square not in Ben Thanh Market. The vendors in Ben Thanh are pretty aggressive. They will hold you firmly and will not let you go if you ask for their price. Haggle, haggle, haggle! Most of the time the vendors will give you the calculator to ask how much you’re willing to pay. Negotiate wisely! For North Face bags, there is a stall in Saigon Square 2 which is famous to Filipino tourists. Even the vendor knows how to speak in Tagalog because of a lot of customers. This stall is located at the back end of the mall, corner of the first aisle. But take note, most of the time your negotiating skills won’t work on her, example you will try to leave her stall if she doesn’t give you your desired amount, she won’t stop you from leaving. Eventually, you’ll come back because her stall has the cheapest price among other stalls. Our strategy was to stay in a budget friendly hotel in Vietnam and splurge on a boutique hotel in Cambodia. We booked thru Booking.com our hotel in Vietnam and Cambodia, Blue River Hotel and Petit Temple respectively. Blue River Hotel is a budget friendly place and is located at the heart of the backpackers district. It is accessible to a pub, convenience store, pharmacy, restaurants and sidewalk stalls. They have a very nice and accommodating staff and we even made friend to our host, Thuy. We converted our dollar thru her and she also booked our tours and activities. So less hassle for us. We also have free breakfast and they offered a pick up transfer from the airport with a fee of 17USD. Our hotel rate is 37USD per night. Petit Villa Hotel is worth spending our money for. The place is screaming Cambodiaaaaaa! Our room was super nice. It has temple lamp shades, the bathroom has a tub and, the room has closet, fridge and TV. When you go out of your room, they have a table and 2 chairs where you can have your morning coffee. They also have outstanding food with big servings. And not to mention their pool! Please see the photo above. 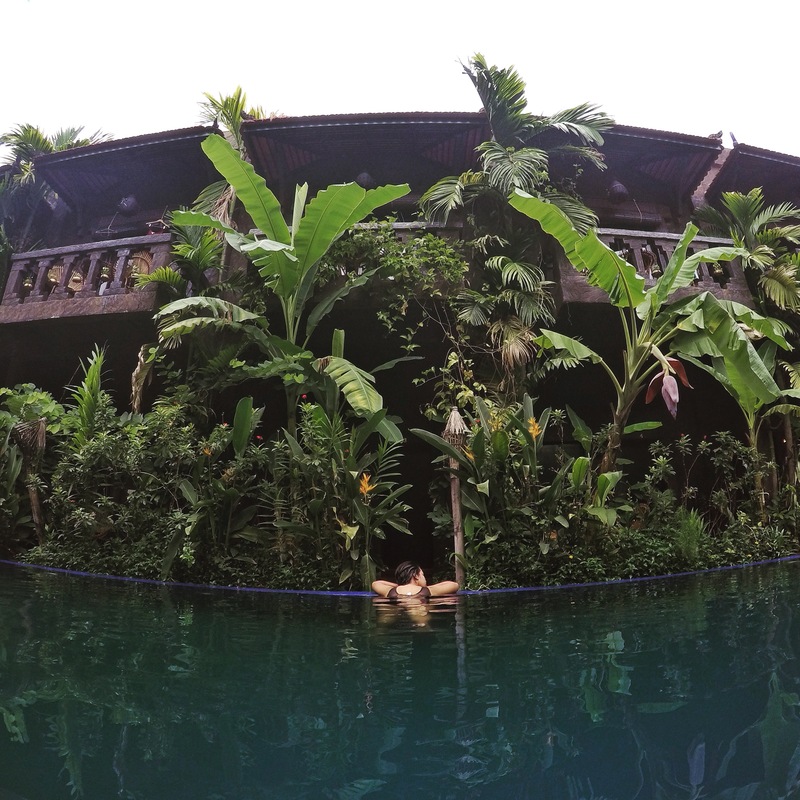 I love their pool and all the greens surrounding me. Our hotel rate was 65USD per night. I highly suggest booking thru Booking.com. I liked it because you are not required to pay immediately via credit card. We paid on the day we arrived at the hotel. The hotel also contacts you via email (in our case, Blue River Hotel did). In Cambodia, I suggest book a hotel near the market. I saw some hotels near the airport, they are very far from the night life and the restaurants! Our hotel is in a good location, it is also near the Angkor Wat. Our activities in Vietnam were all booked by our hotel. We did our own City Tour. 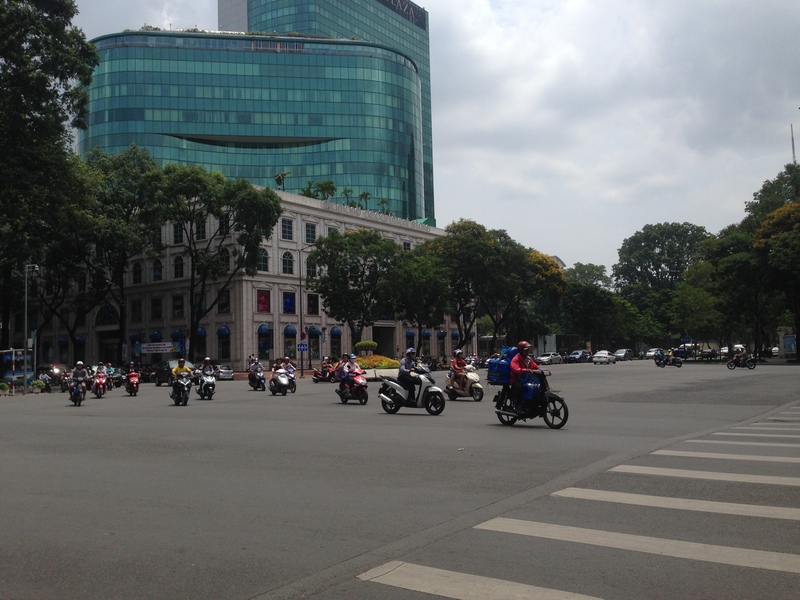 We covered War Remnants Museum, Notre Dame Cathedral, Independence Palace and Post Office. They are all near each other, so you can just walk from one place to another. We regret not seeing the Opera House though. We also booked Cu Chi Tunnel and Mekong Delta Tour. 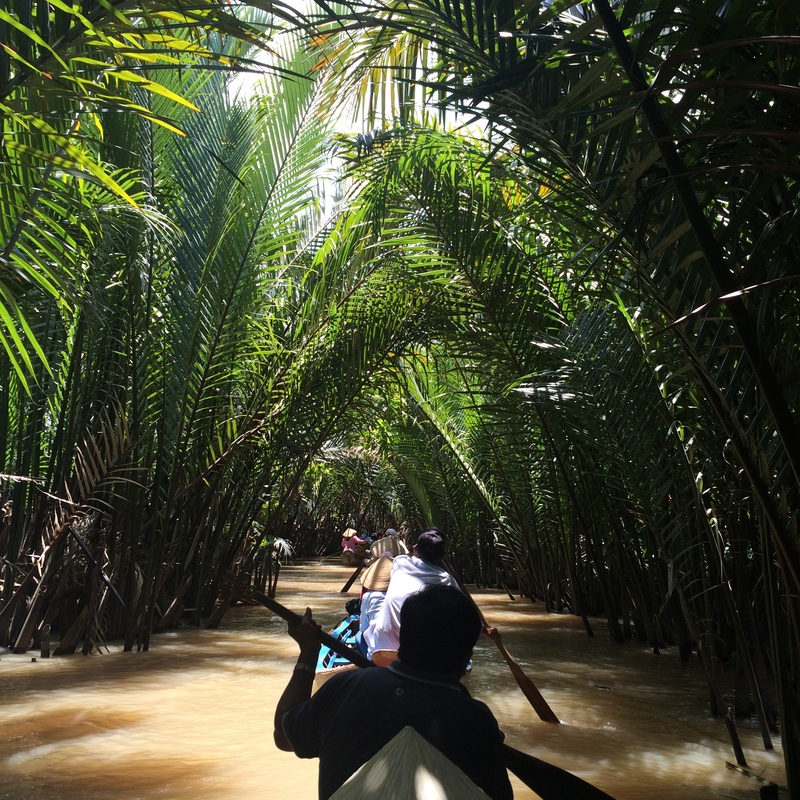 There are other activities you may want to try like the Floating Market in Can Tho. It would be best to check it with your hotel’s receptionist. 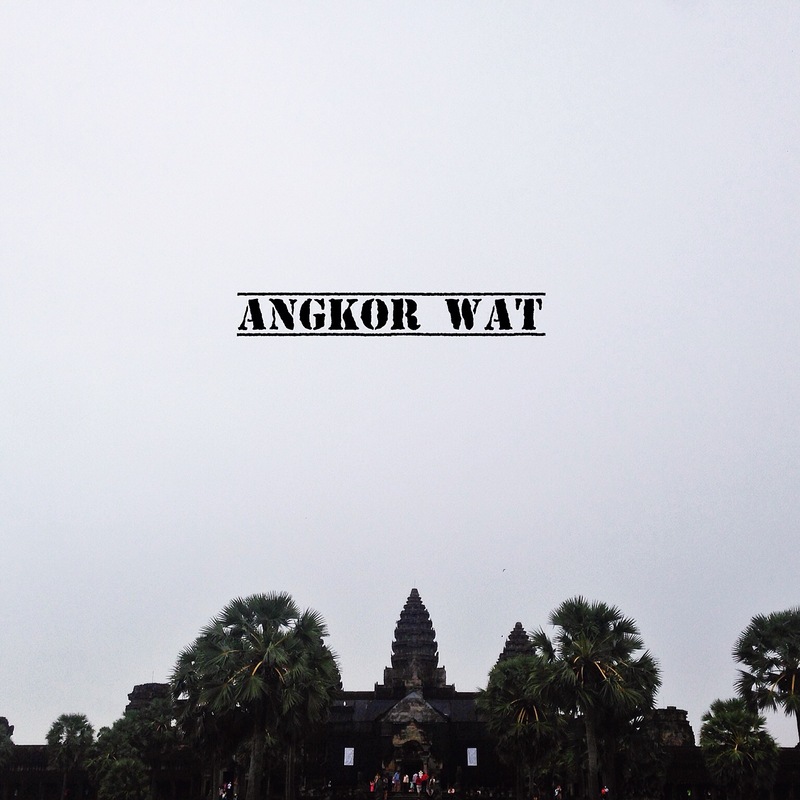 In Cambodia, we limited our tour to Angkor Wat only. The one-day tour is 20USD. And the tuktuk ride is 20USD for sunrise viewing and 15USD if you will start at 8AM. We were offered the Angkor Museum for 12USD and Floating Market for 20USD, which we declined. We opted to do a city tour, to see the market and the souvenir shops. 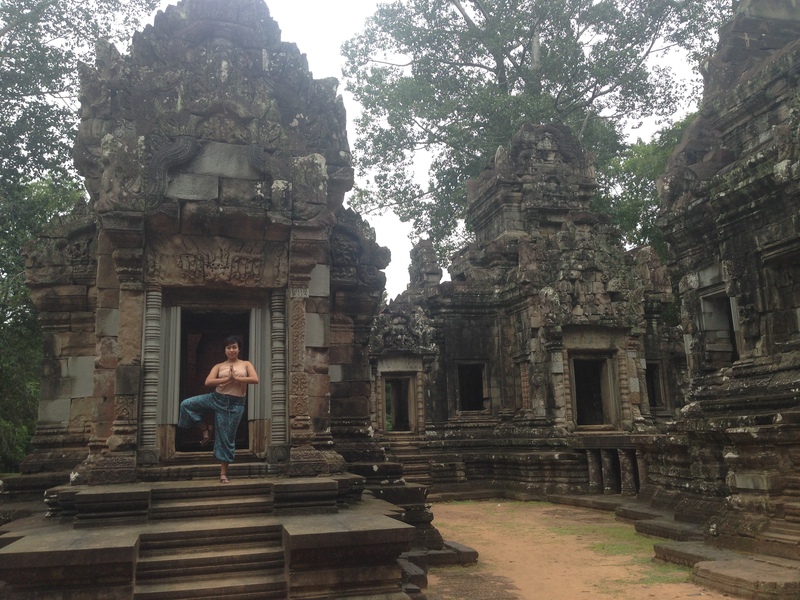 We wanted our stay in Cambodia to be less tourist-y, with exception to the Angkor Wat tour. Our favorite hangout places are the Pub Street, Old Market and Night Market! We ate at the food stalls: Crepe, Pancake, Chicken, etc. We also had beer in Angkor What? To sum it up, here’s my suggested allotted money for this trip. But it still depends on how big of a spender you are. But this is already a safe amount for a tipid-budget trip! 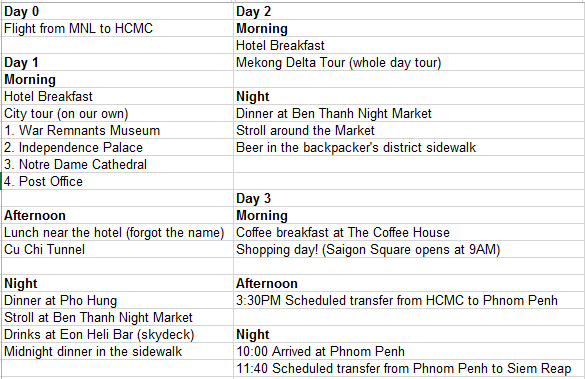 So there, I hope I gave you a pretty clear overview of our itinerary and expenses in Vietnam and Cambodia. I will post another blog post for more details on our trip. Feel free to leave a comment or question if you have. Saw your post via Rappler 🙂 We’ve been planning to go to Cambodia too and your post helped a lot in pre-planning the trip. Haha. Hope to see more of your travel posts! Cheers. Found your post very helpful as we are going to Vietnam and Cambodia next month. Just want to ask which bus company did you take from HCMC? From Phnom Penh? Hi Wella. Glad to know that you found my article helpful. The transfer from HCMC to Phnom Pehn was booked through our hotel. I would suggest ask the receptionist/land lady to find you a bus going to Phnom Penh. I only remember the bus from Phnom Penh to Siem Reap, it was the Gian Ibis (it’s a sleeper bus. Better to travel at night, to save 1 night of accommodation). Hi, Andrea! I’ve bookmarked this post of yours and I’m referring to it for my VietCam trip this September. I have some questions if you don’t mind. The first bus that you rode from HCMC to PP was booked by the hotel upon your check in right? How about Giant Ibis, did you have to book in advance online? Thank you!! Hi, Andrea! I’ve bookmarked this post of your for a while now and referring to it for our VietCam trip this Sept. Obviously the bus you took from HCM to PP was booked when you arrived in the hotel right? How about Giant Ibis, did you book in advanced online? Thanks so much! Hello! I think I’ve read this blog post of yours countless times already. ^_^ May I know what airline you took to and from Manila? First of all, I love how the way you shared your experiences. It was very helpful for a traveller going to explore Camboadia and Vietnam. I have noticed that you travelled at night to go to Siem Reap? Is it safe to travel at night via bus? Is it okay? How’s your experience? First of all, I love how the way you shared your experience. It was very helpful for a traveller going to explore Camboadia and Vietnam. I have noticed that you travelled at night to go to Siem Reap? Is it safe to travel at night via bus?How’s your experience? I wish you would reply. Thank you very much! Hi, Drea! I’ve already come back from my Viet-Cam trip and thank you for sharing your experience! 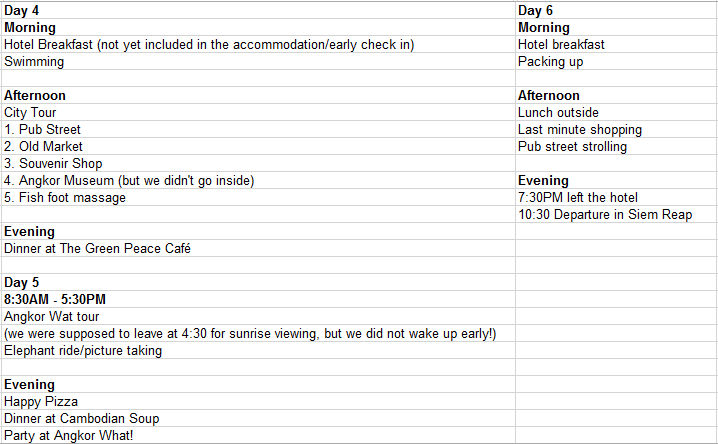 I used your itinerary. Thank you also for your tips and insights. Let me just give you and the readers an update on Blue River Hotel. True enough, they are friendly, but I was disappointed because I communicated with them a week before our trip to coordinate our Mekong tour and bus to SR. When we arrived, I even asked them to be sure, and it turned out they booked for our bus to SR one night before the actual day we were travelling! And because of this, we were able to book an unfavorable schedule in a stinky, old bus with a heavily snoring driver/conductor. I also noticed that there were a lot of hotel guests complaining. Lastly, the room I booked thru Agoda did not look like the one I got in any angle. In fact, on our first night, we were asked to stay in another hotel because their rooms’ AC were broken. This may be a good hotel if you only need a place to stay, and wouldn’t need tour or bus booking. Hi Clerisse. Thank you for sharing this! I’m sorry that you’ve had that kind of experience with Blue River Hotel. I also found out that our host then (the one attending to all our requests) Thuy, already left for the States earlier this year 😦 Now, I would also share your experience when I mention Blue River Hotel. Btw, just to be clear, we are talking about the Blue River Hotel 1 right not 2? Any picture of the stall o di kaya sketch ng souvenir shop? Going there this Friday. Thanks. Hi Miss Andrea! I’m planning to visit Cambodia, Vietnam and Laos anytime this year and your blog really inspire me to pursue this trip. It will be my first travel outside the country and I’m bothered with travel papers needed. if i am to cross Vietnam to Cambodia via bus transpo, will there be any visa or permits needed? thank you so much for your tip in advance. God Bless. Hi Pamela, I’m glad my blog helped you somehow in planning your trip. 2. I’m not sure about packages that has an overnight stay in Phnom Penh. But you can definitely customize your trip. Just look for an accommodation in Phnom Penh, I heard there’s a lot to see in PP too. my friends and i are planning the same trip and this is very helpful. thank you. Do you know if there are overnight trips of buses going to cambodia from ho chi minh and vice versa? Hi Kit. Yes, there are sleeper buses. That’s what we did in this trip. I’ve written a separate blog post about it. 🙂 We took the Giant Ibis bus. Hi! Would like to ask if where did you change your money Php – VND Dong? also what time did you arrived from Phnom Penh to Siem Reap?? Hi Charity, we exchanged our money at the airport in Vietnam upon arrival – right after immigration. It’s the one on the left. As for the time we arrived, if I remember correctly, we arrived in Phnom Penh around 9:30PM, our bus to Siem Reap arrived at 11PM. Then we reached Siem Reap by 6AM. lastly, is it Peso to VND Dong or USD to VND DONG? Thank you so much for taking time to reply! Good thing, you asked. I remember we exchanged our peso to USD in Market Market. Then, we exchanged USD to VND in the airport. Then in Cambodia, we exchanged peso to Cambodian Riel. Yay! thanks for the reply. we’re going tp VIETNAM- CAMBODIA this month end, thank you for sharing!!!! I found your blog post from an article in Rappler and my friends and I are planning to have a trip next year but are still picking which country to go to. I’m wondering how many months/days do you usually book your flight prior to the date you choose? or any tips on how we could get cheaper ones? Hi Nina! Thanks for reading my article. 🙂 If it’s a seat sale, it depends on the travel period of the promo, but thinking about it, I usually book flights 6months to a year prior to the trip. I suggest sign up on the airline websites, I believe they send out communications about the seat sales and members have the advantage on some seat sales. The key is to really wait for these seat sales. Hi! 🙂 Ask ko lang if you need a visa sa borders ng countries for philippine passport holders? Or other requirements sa borders? My friend was asked daw kasi sa cambodian border and I was planning to have a vietnam-cambodia-thailand trip. Thank you! Can I ask, so one way trip to Vietnam and then book the flight back to Manila from Cambodia? Or was it a round trip Vietnam? You had to get back from Cambodia to Vietnam? I’ve travelled to other countries before but this is the first time I’m travelling alone. Hehe..
Hi Angela! Yes, I travelled from Manila to Ho Chi Minh took a bus to Siem Reap then Siem Reap to Manila. I booked my flights separately, but I believe you can book using multi-city, where your point of fly in is different from where you’ll fly out.